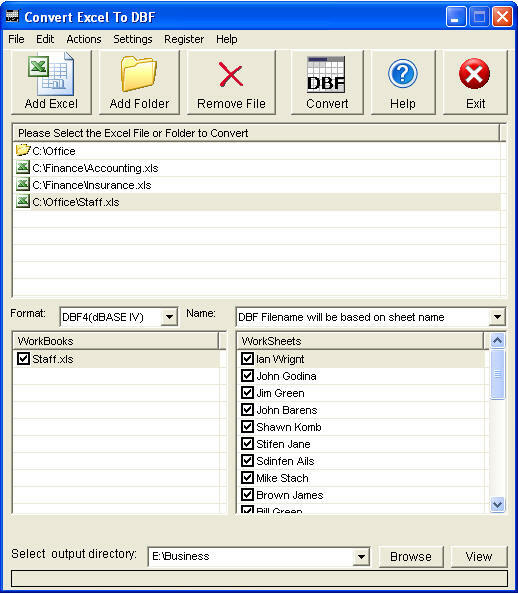 Convert Excel to DBF software can convert your Excel files to DBF format, and also can convert each sheet as an individual DBF file. The software can convert excel to dBase IV, dBase III and dBase II formats. Convert Excel to DBF software can help you convert a lot of Excel to DBF files once time for saving your time. The program supports command line interface. So, you can run it with necessary parameters in a batch mode from the command line or from Windows scheduler without human beings. 1. Batch convert multiple Excel files to DBF files. 2. Batch convert each Excel sheet to a new DBF file in one or more Excel files. 3. Batch convert multiple Excel files to dBase IV formats. 4. Batch convert multiple Excel files to dBase III formats.